Ambassador Haley reportedly pushing for further cuts to U.S. aid to PA, following the cut in funding to UNRWA. The State Department is considering making further cuts to the American aid to the Palestinian Authority (PA), according to a Hadashot (formerly Channel 2 News) report on Wednesday. The report said that the cutting of funding to the PA is being pushed by Nikki Haley, the U.S. Ambassador to the UN, who was also the driving force behind the U.S. decision last week to cut a significant portion of its funding to UNRWA, the UN agency for “Palestinian refugees”. 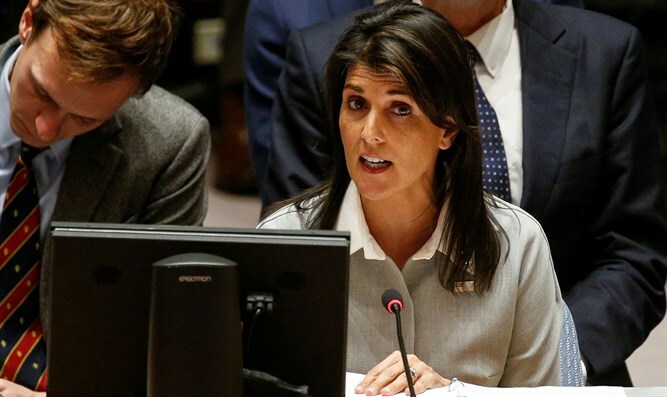 Haley was quoted in the report as saying that PA chairman Mahmoud Abbas needs to pay a price for disrespecting U.S. President Donald Trump in his recent speech to the PLO Central Council. The White House was said earlier this month to have been actively looking at cutting aid to the PA.
That move, as well as the cut to UNRWA, followed Trump's tweets in which he expressed doubt over the usefulness of American aid to the Palestinians, given their refusal to resume peace talks with Israel. According to Wednesday's Hadashot report, some American and Israeli officials are opposed to making further cuts to the PA, warning such a move might "suffocate" the Palestinians financially and cause the situation in the region to deteriorate. Abbas, fuming over Trump’s recognition of Jerusalem as Israel’s capital, announced last month he would not accept any U.S. peace plan. Later, Abbas recalled the PA envoy to Washington, Husam Zomlot, for “consultations” over Trump’s Jerusalem move. However, Zomlot returned to Washington just one day later.